Another year has slipped by, and while we had our ups and downs, returning to our SEO roots has given us greater focus and renewed purpose. We’ve redoubled our efforts with the goal of building the best SEO product in the industry. We know it’s a lofty goal with so many great competitors out there, but this is the target that served as our north star in 2016 and continues to get us out of bed each morning. 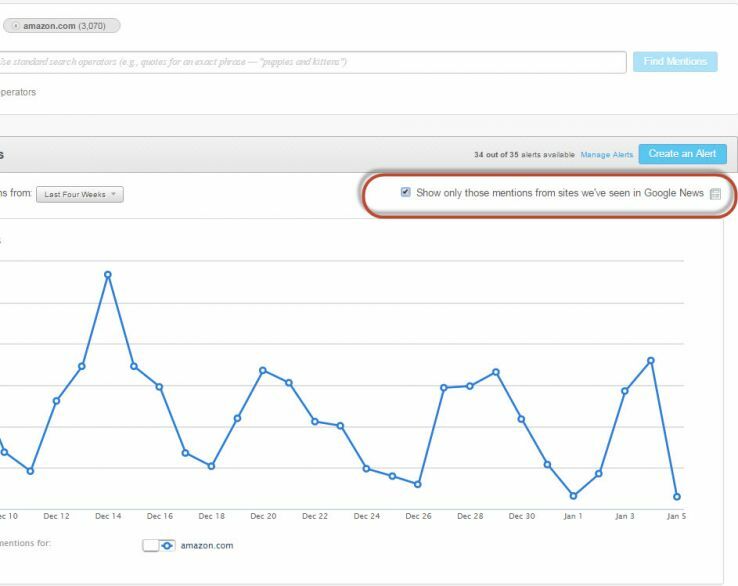 Our increased focus on SEO translated to a big increase in the number of new features and improvements we were able to add to Moz Pro in 2016. In fact, we shipped more significant updates in 2016 than 2014 and 2015 combined, and we already have a lot in the works for 2017. Such ever-increasing demand keeps us on our toes and we continue to invest in scaling our infrastructure to keep the data flowing smoothly. Without further ado, here’s a rundown of some of the noteworthy updates you may have missed in 2016 and a sneak peek at some exciting updates coming in 2017. Okay, I’m sure you’ve heard us mention Keyword Explorer once or twice. More than twice? Alright, we do like to talk about it. Building Keyword Explorer was a huge effort and our biggest release of the year. Keyword Explorer was a passion project for Moz’s co-founder, Rand, and it shows in the quality of the data and thoughtful workflow. 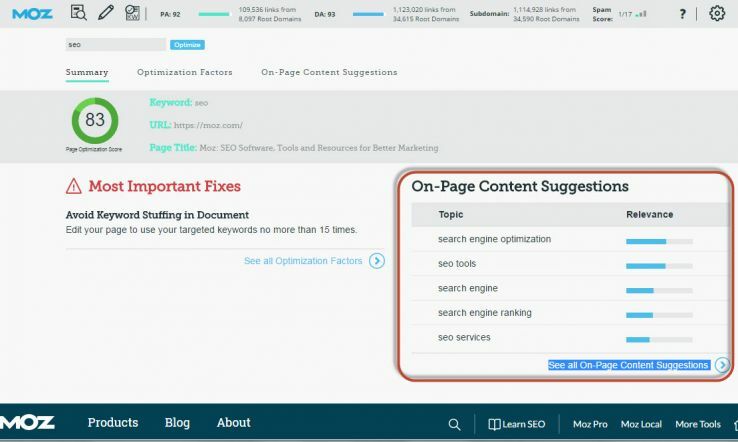 If you do keyword research for SEO or content creation, check out this tool. Keyword Explorer takes you all the way through the keyword research process. Save time and simplify your keyword research process, from discovering keyword ideas to getting metrics to building a list. Once you’ve built a list, filter and prioritize which keywords to target based on the numbers that matter. Keyword Explorer features metrics essential to the SEO process: two you’re familiar with — Volume and Difficulty — and three that are less familiar: Opportunity, Importance, and Potential. Use these comprehensive metrics to prioritize more effectively and focus your time on the best opportunities. We built a keyword volume score that goes beyond what AdWords reports with ~95% accuracy. Accurate, trustworthy keyword volume data is getting harder to obtain, but we’re here for you. Keyword Explorer gathers keyword suggestions from a broad variety of sources, so you can gather a greater variety of keyword ideas from one source. We invested in strong import and export capabilities, so it’s easy to incorporate Keyword Explorer into your existing keyword research process. 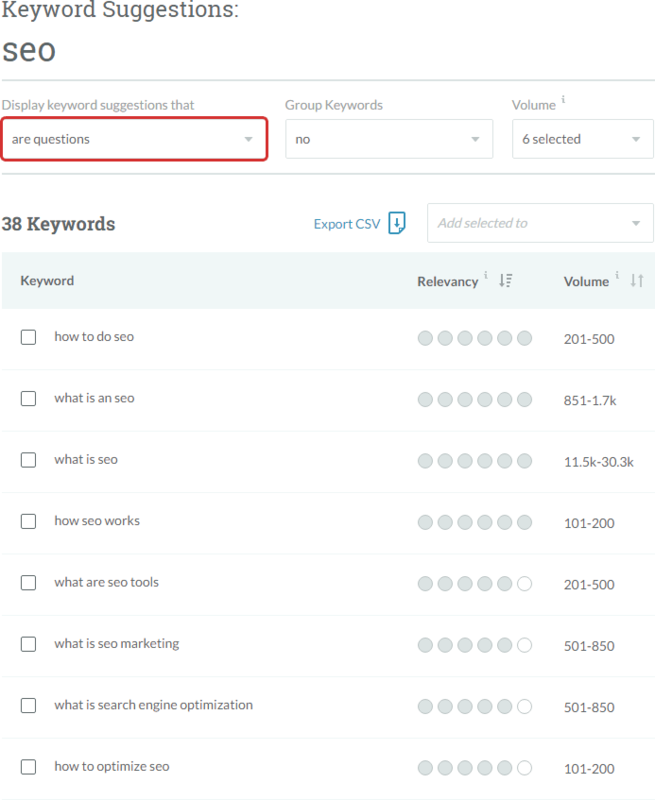 Rather than wading through large volumes of similar keywords and adding each variation to a list, we’ve added auto-grouping as atop any list of keyword suggestions. This is helpful for discovering and focusing on themes, and adding a whole group of related keywords to your own research lists. See if you already rank on page one for they keywords in your lists. This is a hugely valuable data point for prioritizing which keywords to target. This was at the top of the list of feature requests at launch. 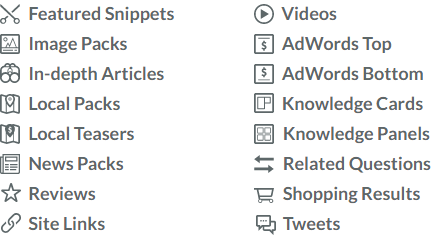 Now you can take the keywords in your carefully cultivated list and add them directly to a campaign for ongoing rank tracking. Clickstream-based search behavior, plus data from other sources, combined with our modeling against AdWords’ impression counts on real campaigns, has given us higher accuracy, more coverage, and faster recognition of volume trends than ever before. It also allowed us to calculate search volume data for more countries, with significant coverage for the UK, Canada, and Australia, more moderate data for other Western languages and countries, and a small amount in regions and languages beyond those. This is great for content ideas, refining existing content, and finding featured snippets you might want to try and win. Track the 16 highest-impact desktop SERP features for each keyword ranking you track in a campaign. View which SERP features show up for the keywords you track, and whether you or your competitors show up in them. See how different SERP features have trended for the keywords you track. You may find that a certain type of search feature is trending up and is worth attention. 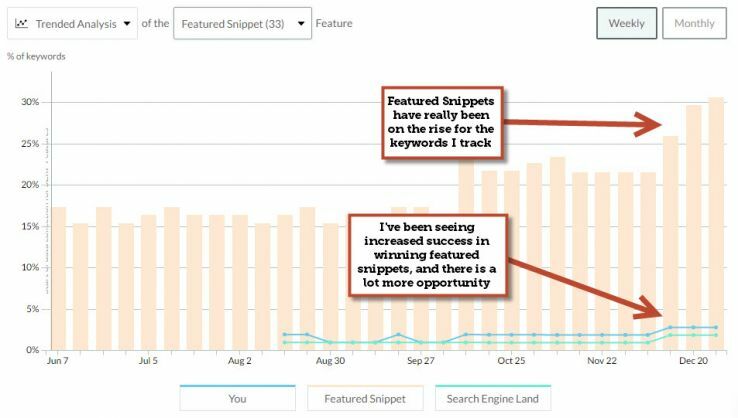 Discover when we think you have an opportunity to show up in a SERP feature and how best to approach it. Featured snippets appear above organic position #1 and can improve click-through rates for keywords you already rank in the top 10 for. Find the most lucrative opportunities for them in your Campaign Insights list. And SERP Features is just the tip of the iceberg. Almost everything else you see in campaign rankings is new or overhauled. We started the year with a significant architectural overhaul of our rankings system. Aside from a faster and more streamlined interface, this also allowed us to support one of our biggest customer requests, and present all historical rankings data. Choose any timeframe to see and report on how your rankings have changed within that period. 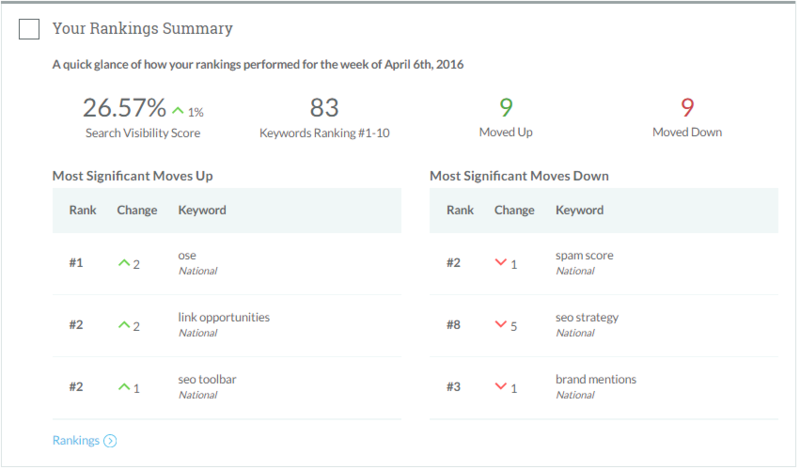 See a dramatic change in your rankings overnight? 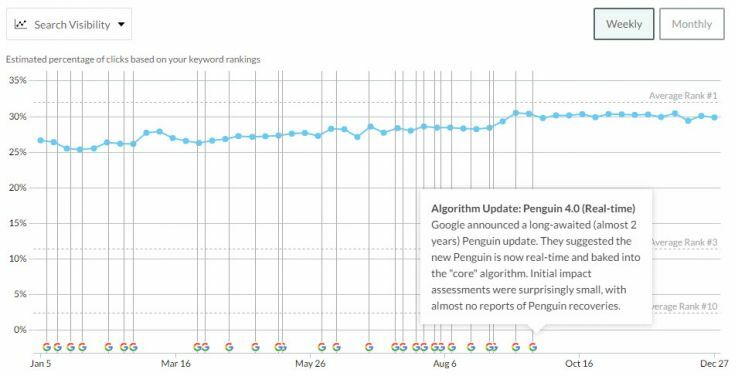 We now leverage the great data from MozCast to show any Google algorithm changes that might be affecting your search presence. Just hover over the little Google “G” to see major and minor update details. Easily filter down your long list of rankings by keyword, label, location, or brandedness, and sort them accordingly to get a handle on your data. This had been a frequent request. We baked in the same powerful search volume data from Keyword Explorer alongside your rankings. We made some big upgrades to this section late in 2015, but we weren’t quite done. 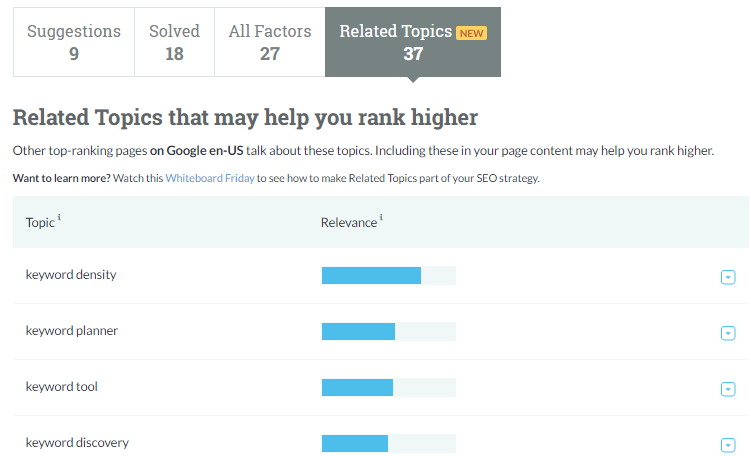 This new tab shown with Page Optimization reports lets you see the topics that your SERP competition is writing about. This can help you understand what kinds of keywords signal topical relevance to Google and provide good ideas for how you can make your content more robust and relevant to searchers. I’m not going to go too deep here, but check out Jon White’s fantastic post for some great tips and examples to get the most from this feature. Rand also shares some great tips in this Whiteboard Friday, Using Related Topics and Semantically Connected Keywords in Your SEO. Quickly run page optimization reports and view page optimization scores right from your rankings. Our Insights dashboard also underwent some solid improvements in 2016. 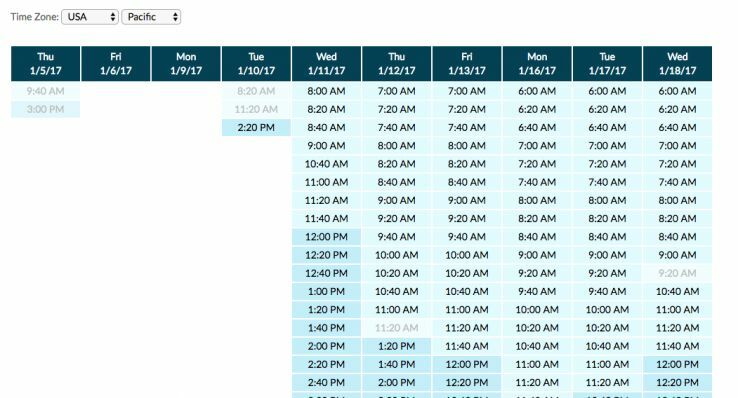 We continue to surface new insights in this section as we add more capabilities across Moz Pro. Our aim is to make this a powerful section that surfaces new problems and opportunities that we discover as we collect and analyze your data every week. We heard feedback that many of you were attempting to use Insights as a to-do list, but we didn’t make that very easy. Now you can check off insights from your list once you’ve read or acted upon them. They will then be moved to your Done list, where you can track your completed work. If you need a more robust workflow, we’ve added a way to quickly add insight tiles to Trello. Trello is a power task management solution, which also happens to be free. I’ve used it quite a bit myself, and happily recommend it. We updated the rankings summary tile to give you a clearer look at your most important ranking changes from week to week. Outside of the more obvious features I’ve shared, we’ve also been working quietly behind the scenes to make our reporting and exports better. Our old PDF export solution was functional, but clunky. It converted page modules into images and then encapsulated them in a PDF. We rebuilt our PDF engine so that PDFs created in Moz Pro include text as text and images as images, offering better editing, copying, and image quality. We launched updated CSVs for campaign rankings that respect filters as well as time frames. Now you can export just the data you need rather than poring through a massive historical rankings export. Adding and managing custom reports is easier to use and easier on the eyes. We revamped our weekly email updates, making them cleaner and more informative. They now include both ranking updates and important insights that we discover for you each week. We plan to add more timely information to these as we continue to improve our datasets and refine the logic behind Insights. If you can believe it, the Mozbar recently surpassed 400,000 installs. It was due a little bit of attention. Unfortunately, our most beloved tool ran into some stability and login challenges when some unfriendly folks started abusing the service behind it. We invested some quality time to fix up the authentication issues and data inconsistency that were becoming a real frustration for customers. 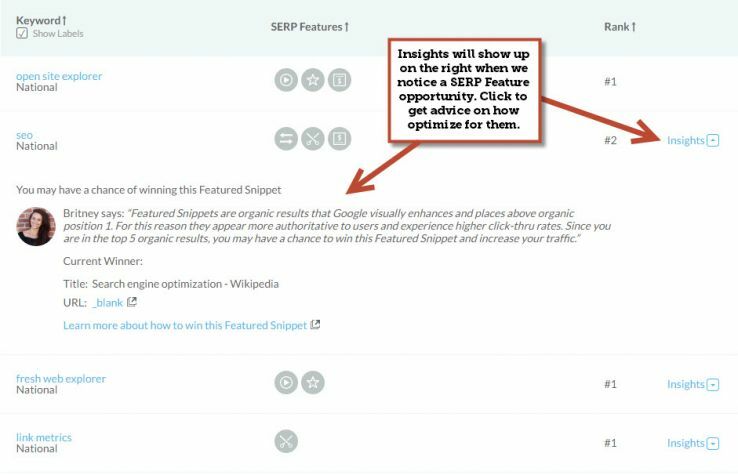 When you enter a keyword, you will now see content suggestions just to the right of the on-page analysis. You can dig in just like in the page analysis section of your Moz Pro campaigns. Use this to beef up your relevance or find new topics to write about. Fresh Web Explorer continues to collect syndicated content from across the Web, making it easy to see where and when fresh content has mentioned a specified brand or linked to a domain. On top of that, Fresh Web Explorer’s alerts serve as a great alternative to Google Alerts, sending you an email anytime we see your target brands or keywords mentioned. Filter your searches and/or alerts to show only those sources/domains we’ve observed in Google News. E.g. here’s a search for Amazon.com with news filtering on (3,067 results in the last 4 weeks) vs. the same search with news filtering off (28,798 results). This can save a lot of time when you’re looking for the most important results. Our hard-working engineering team rebuilt a lot of the scaffolding behind campaigns, making them much snappier to load. This work continues into 2017. They also squashed dozens of bugs and made myriad small improvements across out tools and campaigns. If you are interested in keeping tabs on new features, fixes, or updates, you can find them all on our Moz Pro Updates page. Another important addition we’ve made to our product isn’t in the product at all. We’ve quietly built out a Customer Success team. 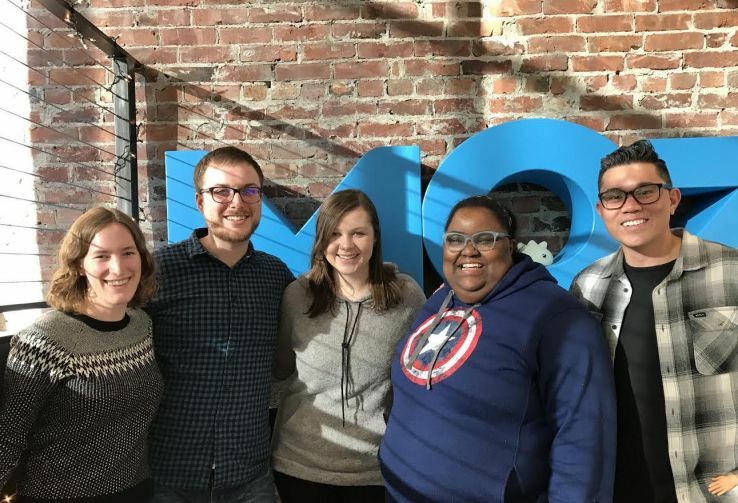 This cadre of product experts provide custom demos for new customers that are looking for an overview of Moz Pro, as well as long-time customers that are interested in learning more about new features. If you are interested in a refresher or a full walkthrough, schedule one here! Also, if you’re looking to level up your SEO skills or get some deeper support in using Moz tools to tackle your SEO strategy, we’re actively working on more paid training options. Stay tuned! I hope you’re still with me, because I’ve got a bit more to share. Here are some of the big things to expect in 2017. A much faster and more resilient crawler. Whether your site is hundreds or millions of pages, expect your crawls much more quickly and reliably. The ability to compare one crawl to the next and see what new issues have cropped up and which were confirmed as fixed. A much simpler interface to access your data quickly and easily. A bunch of other features are in the works to support deeper analysis and customization. More to come soon! Cool code name, but what the heck is it? Do you ever wonder which keywords you already rank for? Which ones your competitors rank for? Who are your SEO competitors? Answer these questions and more with this new data set, which we plan to expose in a number of different ways throughout Moz Pro and in our data products. If you’re curious about accessing this sort of data, please let us know! We’ve got some improvements in the works here too, but we’re keeping this under our hats for now. 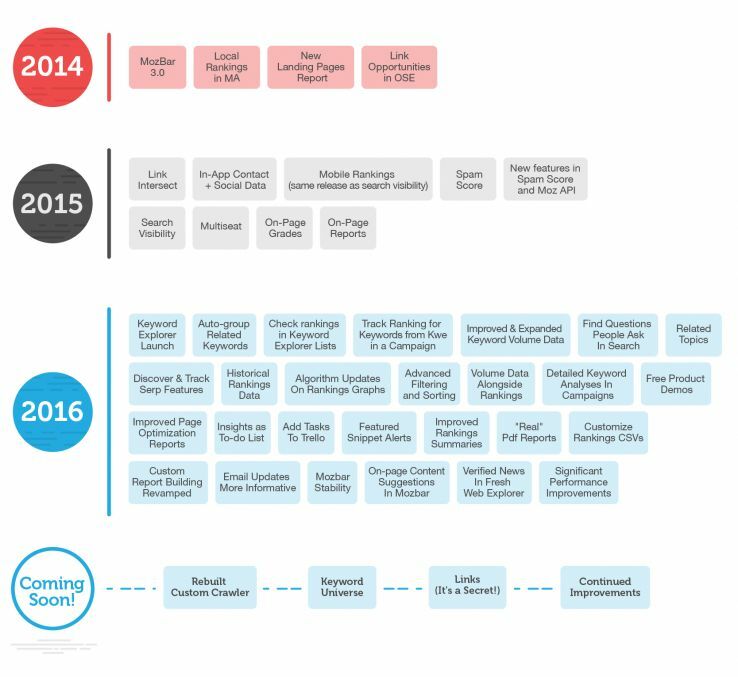 Beyond these large efforts, we will continue to make updates and improvements large and small throughout the year. Please let us know what you need most! We are constantly collecting feedback and looking to solve the most challenging problems that our customers face. Please let us know what’s working for you, what isn’t, and what you need most to be successful with your SEO efforts. You can add your thoughts in the comments here, or message me directly. While we can’t get to everything right away, we are always listening and prioritizing what to work on next. Thanks for reading. I hope you all have a fantastic 2017!